EAB's 40th Annual General Meeting was held on 21st May 2016 at The Melting Pot, Edinburgh. 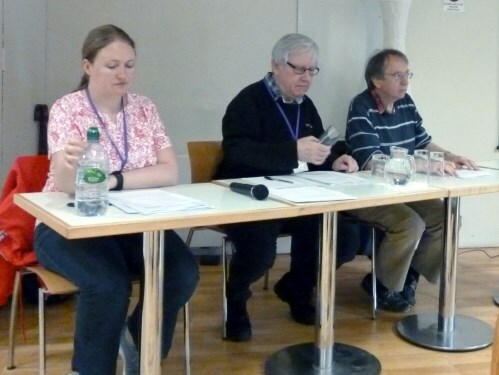 The meeting was led by trustees Clare Hunter, Ian Carter and Ed Robertson. The minutes of the previous AGM [in Liverpool, March 2016], the Trustees' Report [for year ending October 2016] and Financial Report [for year ending October 2016] were presented. 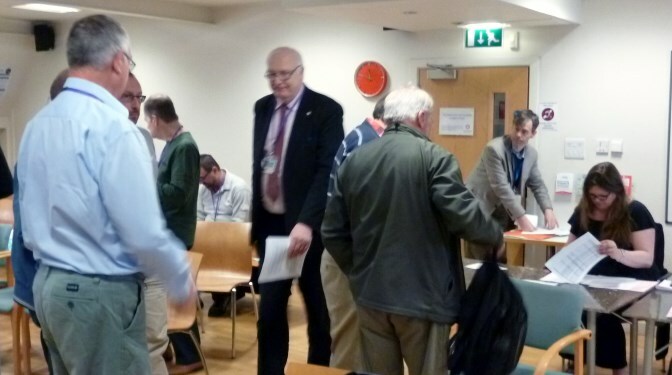 The minutes were approved as an accurate record of what had been said at the previous AGM, and there were then some comments and discussions about other matters. It was clarified that the Trustees' report is a report by the Trustees (not the Members) to the Charity Commission and had already been submitted in February (along with the financial statement); there were then some further comments and discussions about other matters. There was a question about the footnote references in the summary financial statement; Clare Hunter explained that the full 16-page statement (including footnotes) are accessible to all via the (relevant section of) the Charity Commission website, or on request to Esperanto House. The proposals to re-appoint the current independent examiner, and to leave the [voting member] subscription rates unchanged, were all approved. Clare Hunter introduced a discussion about the object of the charity (i.e. its stated mission and purpose). The trusees intend to review and perhaps to revise this, to address members' concerns (expressed at previous AGMs) about the heritage of the Bulter Library and Esperanto culture in Britain. The wording has to be chosen carefully, because it can have legal consequences for the charitable status of the Association, and will then have to be approved by the Charity Commission and a future Annual General Meeting before it can be adopted. A working draft revision was presented for discussion; Clare explained any wording which implies that the charity works for or benefits only a select or exclusive community would probably fail to satisfy the Charity Commission's rules. Working draft revision: "To advance education in and about the international language Esperanto, and to preserve the cultural heritage of Esperanto, for the educational benefit of the general public." The votes for the Mananagement Committee* were counted by Viv O'Dunne. Ian Carter, Geoffrey Greatrex, Edmund Grimley Evans, Clare Hunter, Damon Lord, Kathryn Newbould, Sally Phillips, Ed Robertson and Geoffrey Sutton were elected as trustees. Ian Carter was the sole candidate for president of the Association, and so became the new president. The motion to amend the EAB constitution (to revert to a previous version) was not carried.